What a time to be alive, especially in the business of government IT. Several policy, business and technology trends are converging to provide game changing opportunities for government agencies to leverage and improve their mission outcomes. The U.S. government is making moves toward a comprehensive approach in modernizing information technology systems, as the administration is rolling out several initiatives, including the enactment of the Modernizing Government Technology (MGT) Act; the release of the finalized IT Modernization Strategy; and the launch of the Centers of Excellence initiative led by the White House’s Office of American Innovation. 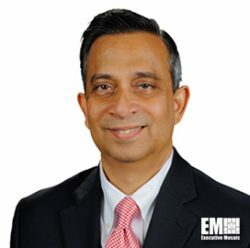 To comment on the status of modernization within the federal government, ExecutiveBiz interviewed Venkatapathi “PV” Puvvada, President of Unisys Federal and recently-elected chairman of the Professional Services Council (PSC) board of directors. As a regular contributor to FCW and Federal News Radio, Puvvada surely has some wise words to offer. EM: You’ve been at Unisys for a while now, filling a number of key executive roles. What are some of the bigger challenges you have faced during your tenure? PV Puvvada: I’ve been at Unisys for more than 30 years and have occupied key executive roles across different functional areas over the years as a consultant, technology leader, a program leader and a P&L leader focused on technology and management consulting. I’ve had the good fortune to work with the company for a long time, having the opportunity to learn many aspects of technology and business from several leaders and mentors. The challenges I’ve faced when moving into new executive roles tend to be along the lines of: how do you convey to staff a sense of your agenda going forward, without people focusing on their perception of you in your prior role as opposed to your new one? The best way to address that is to stay relevant in your new role and communicate clearly what you need everyone to be focused on. Technology changes rapidly, and along with that business models evolve quickly. You have to make sure that you go through required organizational transformation to be relevant in the market. A leader has to work with people so that they understand the opportunity for transforming, as well as the risk of not transforming. Transforming a culture is much harder than changing it slowly over time. You were recently elected to serve as chair of the Professional Services Council (PSC) board of directors. What are your responsibilities as a chair person? PSC is one of the most important industry associations that serves professional services and technology government contracting companies. My role as the chairman of the board of directors is essentially a strategic role as a non-executive chairman. It’s about making sure that that PSC’s strategy is pointed in the right direction, governance is strong and that they are meeting the needs of the member companies. PSC has a very good reputation, strong leadership and provides several valuable services to members. As a part its governance, the PSC board and its Executive Committee does a good job of providing oversight of key initiatives and makes sure that we help the government to be a smart buyer. In terms of what is to come, I announced at a recent board of directors meeting that we’re going to begin a strategic refresh and take a look at our future direction. We are proactively seeking input from the membership on their most critical needs and their expectations. Based on the input, we will address key questions such as, “Should there be a refinement to our current set of offerings?” and, “Should there be a change to the strategic priority and strategic direction?” PSC will roll out any resulting changes in the spring timeframe. I’m really looking forward to working with my colleagues on the board, the executive committee, the CEO and other senior staff in this role. You recently published an article on “The Security Aspects of Modernization,” referring to federal government spending on the IT budget to maintain ‘legacy systems.’ What do you feel is the solution to getting government agencies off the older legacy systems and onto new platforms? I’m a monthly columnist at [FCW] writing about various topics, and some of my recent ones have looked at topics like the security aspects of modernization and how to implement agile development at the scale necessary for large federal agency systems. IT modernization in a broader context is really hard to do with the government–the reason being that there’s a very complex mission and many regulatory compliance needs to be met. So this is why the administration is prioritizing focus on modernizing core mission systems that are “high-risk, high-value” assets. Typically, people tend to take a technology perspective with modernization efforts which result in high rates of failure. They want to have everything all figured out using technology, as opposed to using a business-driven agile acquisition approach to apply agile method to key business requirements in smaller manageable chunks. Successful modernizations take a business transformation approach where business value, simplicity and business process innovation trump technical elegance. At the same time, managing the modernization journey by proactively anticipating difficulties and risks ahead of time will be key. Most often, people encounter unanticipated difficulties complying with security requirements and also with migration to the cloud. However, once you finish the journey, you’re going to find the benefits of the security that comes with a modernized environment and the flexibility and agility of the cloud business model. There is no magic silver bullet for IT modernization in the government—given the nature of the government’s complex environment. It is done by taking a comprehensive business-driven and risk-managed approach to modernization and applying agile methods to deliver manageable, high-priority business-functional pieces. In working with clients and government stakeholders, what steps need to be taken to improve the contract bid and award process within the federal marketplace in 2018? We’re hoping that we get our full-year budget sorted out early in 2018, where we’ll have more time to do the planning than we do typically. What is needed to improve the acquisition process overall is proactive communication between government and industry partners. This will provide a better outcome for citizens as well as government and industry. In general, I’m optimistic about 2018 for Unisys because we’re making key investments to innovate, and we are well positioned in all of the right places where there are opportunities to grow. What are the more important lessons you have learned from developing IT strategies for the federal government? The most important thing about developing IT strategies is not just about the technology or to align just to the CIO’s organizational priorities. As I mentioned before, the most important aspect of a good IT strategy is that the IT solutions are relevant to the mission. The strategies that are developed have to have a clear alignment with the mission and mission outcomes. That leads to success. Without implementing a proper strategy, you’re going to be constantly chasing a trend that may or may not be relevant. Having the appropriate skill sets to implement the latest technology to achieve mission goals will make IT strategies practical. The other lesson learned is that stakeholder buy-in and engagement happens with a proactive and transparent governance model between the IT, Mission, Contracting and CFO organizations. Industry partners that bring their expertise to develop and enable IT strategies that deliver significant value to not only to the CIO, but also to all key stakeholders will be successful.